← Enforcement of the NMW – a fair sport? Six months ago, I noted on this blog that, in 2014/15, there had been a marked increase in the median awards for unfair dismissal or discrimination (the only jurisdictions for which the lackadaisical HMCTS bothers to record the relevant data). And I suggested that this might be the beginning of a sharply upward trend, due to the justice-denying fees introduced in July 2013 having eliminated many lower value unfair dismissal and discrimination claims. Well, this week we got the figures for 2015/16, in amongst the latest set of quarterly ET statistics, for Q1 of 2016/17. And, as the following chart shows, we do appear to have what Sean Jones QC would call a trend thingy. I have left out Age, Religious and Sexual Orientation discrimination, for the simple reason that the number of awards in those jurisdictions has always been very small. 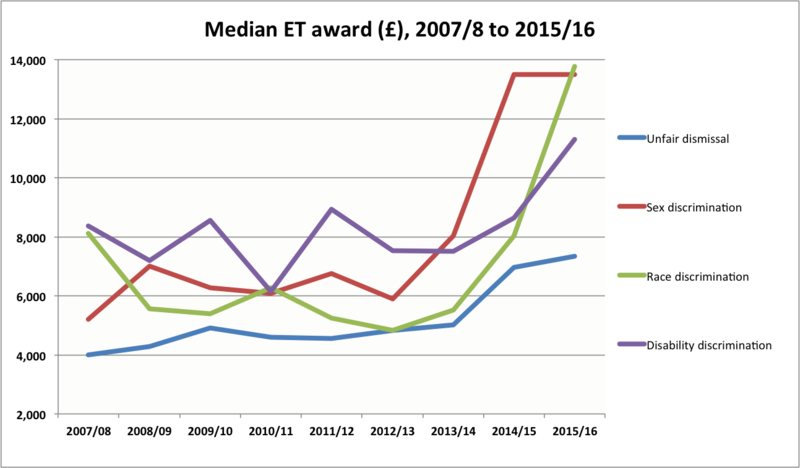 For example, the median award for Age discrimination did increase, from £7,500 in 2014/15 to £8,417 in 2015/16, but there were only four such awards in 2015/16. 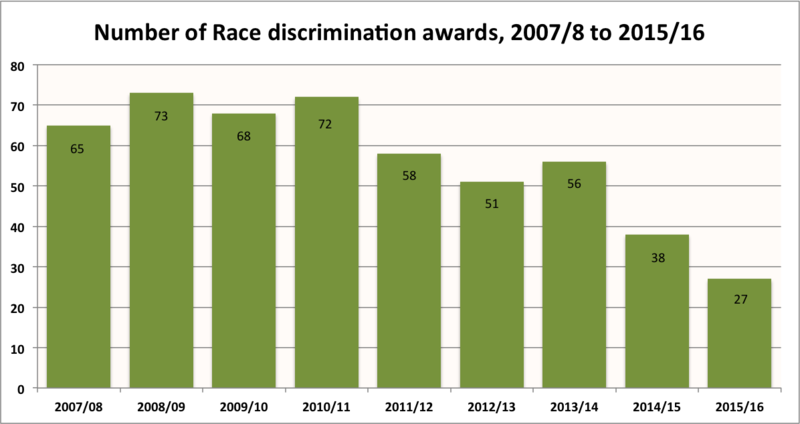 Similarly, the median award for Religious discrimination increased from £1,080 in 2014/15, to £16,174 in 2015/16, but there was just one such award in 2014/15, and only four in 2015/16. With such small numbers, the median award is prone to significant variation in any case. And, as the following charts show, the upward trend in the median award is indeed married to a sharply downward trend in the number of awards – reflecting the sharp fall in the number of claims following the introduction of fees in July 2013 (as well as the introduction of Acas early conciliation in April 2014). If you’re reading this and you’re a junior minister at the Ministry of Injustice, you are no doubt thinking, ‘ah, but lots of people are now getting their claim for unfair dismissal or discrimination resolved by Acas, for free!’. Which is true, to some extent at least. But, crucially, while the quarterly ET statistics have always told us the number and outcome of claims in each jurisdiction, the quarterly Early Conciliation statistics issued by Acas are not broken down by jurisdiction. So it’s hard to know to what extent Early Conciliation by Acas is successfully mopping up the lower value unfair dismissal and discrimination claims and awards lost to fees. Now that Early Conciliation by Acas plays such a significant part in the ’employment dispute resolution’ system, that is a serious shortcoming that Acas needs to fix. This entry was posted in Justice and tagged Discrimination, ET awards, ET fees, Unfair dismissal. Bookmark the permalink.